Traditional Country Gospel - Vocal style like big brother Lefty Frizzell , If you like Keith Whitley ,Randy Travis, Merle, Alan Jackson you'll enjoy this CD. How cool is it to hear those fabulous Frizzell tones sold out for Christ and singing for the Lord? I LOVE it! 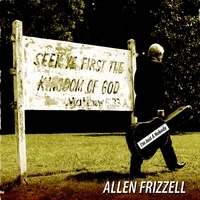 Allen Frizzell proves that the Frizzell twang vocal delivery is deep in their genes. Even if you're not big on gospel music, you'll surely love this album. It's got that beautiful traditional country sound and was produced by the artist. Allen also wrote or co-wrote all but three of the eleven tunes on the CD. It's like getting the best of both world's, you hear a lot of Lefty and a little bit of Merle creating a vocal style that's all his own! Best country gospel I heard in a long time. was giving our Lord Jesus the praise He should have. It good to hear someone sing country for Jesus. I hope someday He will do a DVD Live. WOW! This is simply the best gospel album I've ever heard! I've never been a big fan of gospel music but I guess I am now. I also need to say that this album is Country to the core. Great job Allen. GOD BLESS YOU YOUR AWESOME ,WHERE HAVE BEEN? I GREW UP ON YOUR BROTHERS AND THE HAG,AND CAME TO KNOW THE LORD JUST IN THE LAST COUPLE OF YEARS AND I FILL THAT YOUR MINISTRY IS RIGHT UP MY ALLY. This CD is one of the very best that I have heard in a long time. I love that true country sound, and it is all over this project. I am glad to see that the country sound can also be in Gospel music too.